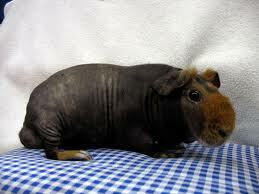 Hi, I just bought a skinny pig, she was 7 months old and a little under nurished. Now she won’t stop eating, she is actually getting quite fat, what should I do? I wish that I could send a picture of her. Hello (I have a male skinny pig and a male guinea pig (long haired ) ) okay when I first got my skinny pig HE ATE SOOOO SOOO SOOOO Sooo much i had to get this bin feeder for him and before I had to get him new food everyday then now once a week or every other week so i recommend a bin feeder you can find it at pet stores (: and my skinny was skinny not sick skinny .I think skinnies will get fatter with age so dont worry (: . 1) at what point do I consider giving the skinny floor time? 2) I have not seen the skinny drink but I have a bottle set up as well as a bowl. What can I do to ensure the skinny is drinking? 3) How should I go about getting it used to me as it runs away and hides when I try to take it out of its cage? When I do take it out, and hold it to my chest gently stroking its back it stares at me and does not move. 4) What does the cooing noise sound like? I have heard YouTube videos of skinnys as well as mine making squeaking noises. Thank you so much for your help! Any advice you can offer is much appreciated. #1 okay floor space (: I let mine out not soo often because I’m a really busy person but I try to let him out I let him run around some times he LOVES IT!!! And the answer is whenever i Held mine alot when he was a baby and i let him walk around too! Now he is really friendly (: !